U.S. Army veteran and Dempsey Middle School alum Justin Winebrenner speaks to students at Dempsey Monday during the Veterans Day assembly. Winebrenner was one of dozens of veterans who attended the event and briefly spoke to students about their service and experiences. Each veteran was given a round of applause by students. Students at Dempsey Middle School held two Veterans Day assemblies Monday where they thanked veterans for their service. 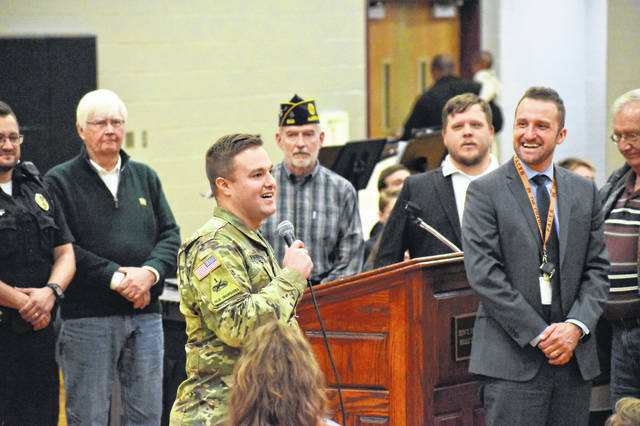 Dempsey Principal Dan Bartha said Monday afternoon that about three dozen veterans attended the morning assembly and about four dozen attended the afternoon assembly. During the assembly, the Dempsey Band, Dempsey Players and Dempsey Choir played and sang a variety of patriotic songs, including the national anthem and the song for each branch of the armed services. Dempsey Assistant Principal Brittney Nowlin gave a short speech to students and stressed the importance of honoring veterans. Nowlin said Veterans Day began as Armistice Day, which commemorated the signing of the armistice that effectively concluded World War 1 on Nov. 11, 1918. Nowlin said President Woodrow Wilson declared the day Armistice Day the following year, and in 1954, President Dwight Eisenhower signed a bill that changed the name to Veterans Day. “With that history, we are gathered here today to honor all who have served and those who continue to serve,” Nowlin said. Bartha then invited the veterans to come up to the podium and introduced themselves. The veterans who introduced themselves received rounds of applause and cheers from students. U.S. Army veteran Justin Winebrenner said it was a fun experience for him, since he attended school at Dempsey. “It felt great,” he said. After the assembly, Nowlin detailed what she hoped students took away from the assembly.